When I first jumped on Instagram in late 2015, I didn’t have a clue what I was doing, like many others starting out. I was going around in circles, over and over again. This only led me to a dead-end; most of the information I came across contained more questions than answers, nothing really concrete. During my research, I found most Instagram books especially some of the ones on Amazon; are written by people who have never even used Instagram. These books contain generic fluff you could find with one Google search. How was using the top hashtags, that have been indexed by millions and millions of posts, supposed to help me grow? Like everybody uses them. I wouldn’t stand a chance of my content being seen. Was this really the truth of Instagram growth? I thought it was, until I stumbled on a few forums, messenger apps and made some useful connections. This is when I realized people who actually knew the real stuff didn’t really share the secrets. When I mean the secrets, I am talking the hacks. Why would you? If you know, you know — I guess. The Internet is a powerful thing when you look in the right place; from that moment on I never looked at Instagram the same. This when I decided to document my findings and Gram Hacks was born. Gram you may ask? For many its Insta, or Instagram, but for the cool kids its known as the “Gram”. People now phrase a capture for Instagram as “let’s get one for the Gram”. So that’s the Gram explained, now let’s move on to the hacks. Growth hacking, these two words usually are attached to stigma, especially the word hacking as this method of approach confuses people to think hacking is all-criminal. So before I begin, let me reassure your concerns. Growth hacking isn’t illegal or criminal, its about finding creative new ways of doing things on low budgets, making the most of what you got to work with. Growth hacking gives you a great understanding of marketing, systems, networks and code. However, it’s not focused on conventional marketing strategies, but on finding the most efficient alternatives that deliver the highest impact. So why should you listen to me? What makes my information the gospel? Well, for the past year and half I have been on both sides of the tracks with Instagram, in the so-called underworld where the Instagram Mafia live and black hat methods e.g. illegal protocols rule the roost. Then there’s the right side of the track where the white hat methods are, you know the conventional stuff: paid ads, cross promotion, authorized software and common practices etc. I have grown to 300k followers across my networks of accounts, including growing and selling accounts. I have made revenue from shoutouts and now manage Instagram accounts for clients. These findings have enabled me to also provide consultancy for businesses that want to utilize Instagram as a marketing channel. I’ve enjoyed some perks of Instagram such as being invited to exclusive private events, just from networking on the platform and sharing content. Overall, just using Instagram the conventional way works to an extent but sometimes the extra push is needed — things I wish I’d known when I started. This is why I wrote this book in the first place, to help you navigate this complicated and exciting medium called Instagram. 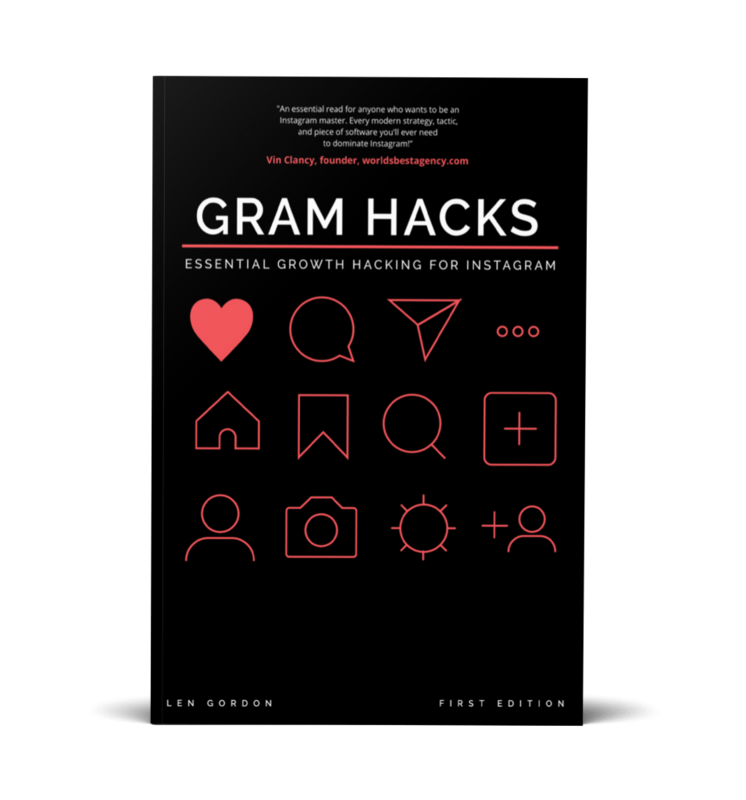 Gram Hacks contains everything I have learnt through my Instagram journey so far.